Why Back Up Your Life? 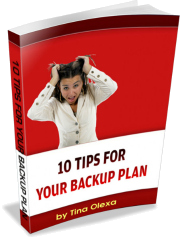 Download Your Backup Plan App! Feel Free to Share On Social Media! “Chocolate is a vegetable, because it comes from a bean.” This is just one of many doubletake statements you’ll hear from Christine Awram (while wearing a pink tiara), as she encourages women to question any of their beliefs that limit an empowered, joyful and successful life. She’s the founder of Woman Of Worth WOW Worldwide and is a dynamic speaker, author, visionary and philanthropist. Christine radiates vitality with her indomitable spirit and humour. Yet her earlier years began as a teenage runaway who experienced addiction, illness and depression. She inspires others by sharing the specific strategies she used to move from futility to fulfillment, and how she transformed challenges into passion and purpose. Christine’s commitment to the empowered leadership of women resulted in her being honoured with the Outstanding Leadership Award by the Global Women’s Summit. She has personally inspired over 10,000 women through her WOW events, and believes she is just getting warmed up.